We were already deeply honored to be nominated for two Edison Awards in the category ‘World/Jazz’. 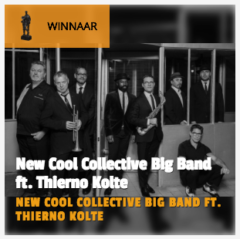 But now even more so because our album ‘New Cool Collective Big Band feat. Thierno Koité’ won the Edison for ‘Best World Album’ ! The prestigious award will be awarded on Friday July 6th during the Edison Jazz / World 2018 event as part of North Sea Round Town, the fringe festival of North Sea Jazz in LantarenVenster, Rotterdam.